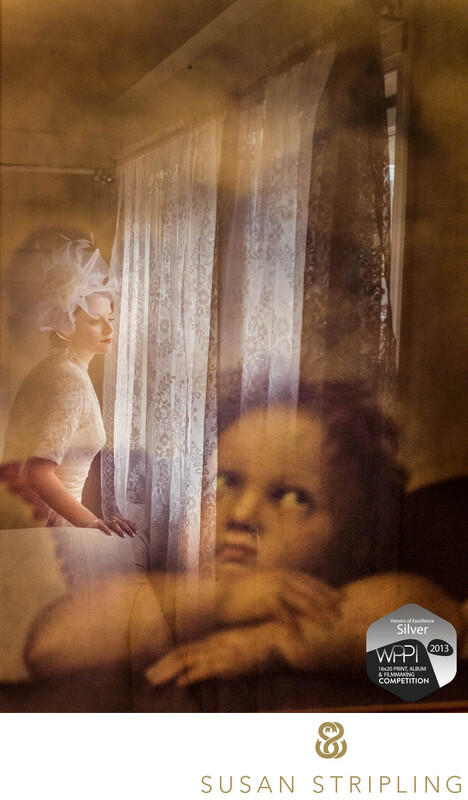 I adore this image of the bride at the window during her 2012 wedding at Holly Hedge Estate in New Hope, Pennsylvania. This photograph is an excellent example of what I strive to create at every wedding that I shoot. It’s unique and creative, beautiful and flattering to the bride. I love the quiet moment and peaceful expression the bride’s face. I love the reflection of the angel, looking up and out in the same direction that the bride is. I also love the bride’s phenomenally glorious sense of style. I can do everything within my photographic power to create a beautiful image but it’s the spirit that the bride brings to her portrait that really causes an image to shine. This image was entered into the print competition in 2013 into the Wedding Division Bride or Groom Alone category. It received a proper score of 80, meaning that it also hung later that week in a dedicated gallery at the WPPI convention. The gallery exists to share the top scoring images in the competition and it’s always an honor to see my work there amongst the work of my esteemed colleagues and friends.Keywords: Holly Hedge (12), New Hope (12). 1/60; f/11.0; ISO 8000; 70.0 mm.